Overall, we were really happy with week 16. We were so close to 100 points and a few of our picks came through for us. It turned out that investing heavy in the double game teams was the best idea this week, but some of the results were crazy! Vancouver at home WTF! In the end, we saw some green arrows and that’s always nice. WILD CARD! Yup, that’s what we did this week, so out team went through a lot of changes. Basically, we kept our eyes on the transfer numbers and tried to bring in guys that we thought would go up by $0.2m. Unfortunately, trades were light and we only gained a few points of value. I only actually set the team a few hours ago. So here’s what we have now. We dropped Shuttleworth because they have a couple of bye weeks coming up. In his place, we picked up Donovan Ricketts. We really like how Portland has been playing recently and Ricketts has the ability to get nice save and recovery bonus numbers. We kept two of our defenders this week. Nathan Sturgis is playing OOP in midfield and getting goals, eventually he may be replaced by Olave though. Matteo Ferrari has a bye this week, but Montreal has a fantastic run of games after. We want coverage for that. We also added two familiar names from our past. Aurelian Collin and Michel Gabrini are back in our lineup. Not much explanation needed. Finally, we brought in a guy we hope will not leave soon for the Gold Cup, Omar Gonzalez. He’s the heard of LA’s defense and they have been suffering without him. Out midfield also has several familiar and big names in it. Javier Morales and Landon Donovan are two we kept (though we expect to trade Landon soon). TO join them, we added Grahm Zusi and Brad Davis back to our team. Davis may just be here for a short time, but we like the Toronto matchup a lot. We needed a little bit of budget for our final choice and we decided to go with Oriol Rosell. We could have found a sacrificial player, but we like SKC’s lineup in the coming weeks, so we’re rolling with it. Finally, our forwards stayed similar. Marco Di Vaio stayed on our team but was loosing vale, so we actually dropped him to avoid some loss and then added him back today. We kept Deshorn Brown and have also added Robbie Keane to replace Jack Mac. I know Keane had a rough game against Portland, but we expect him to explode against Chivas. Now I’m sure most of you are wondering about our captain pick. Well we’re going for something cheeky here. It’s been dubbed the #Caparoo. 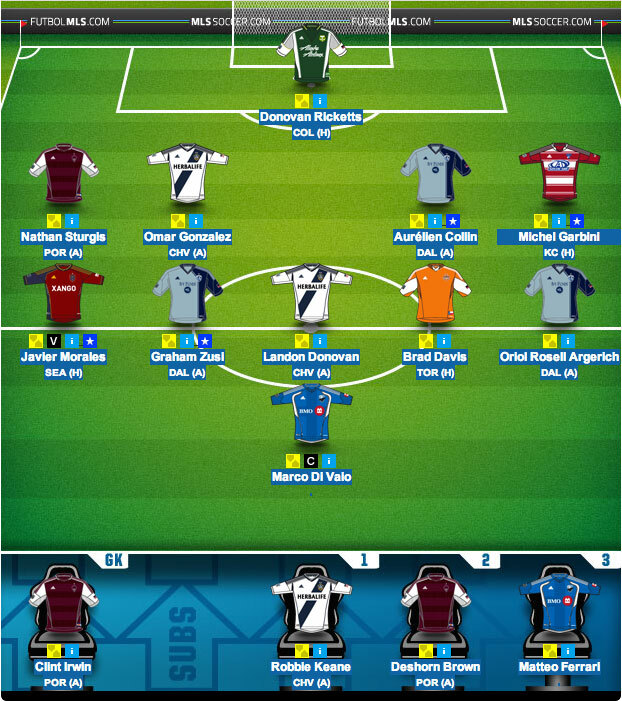 Since LA is playing later in the week, we have given Di Vaio the Cap because we want to see if Morales will do well. If he does, we will leave things how they are and he will become the captain and Keane will get subbed in for Di Vaio. If Morales get a 2-point game, we will use our Manager Sub to bring Keane in and change our captain. Some think it will not work, but we have faith. Week 18 is a little mystery to us right now. We have several players who are Gold Cup risks. We hope to hear the roster before the end of the month so we have time to adjust out team. But you can expect to see more Montreal players and possibly Olave. So that’s the KFC team for Week 17. What do you think? How did your team do? Have any questions for us? Want input on your team? Stop by r/FantasyMLS and post. There are many good members who can help out with questions. We are also now on Twitter @FantasyMLSTips. Feel free to tweet us too. I was able to make the switch last night from Di Vaio to Keane. I’m just waiting for the ned of the games tonight to see if everything goes smooth. I have screen shots. I’ll be sure to make a post about it.